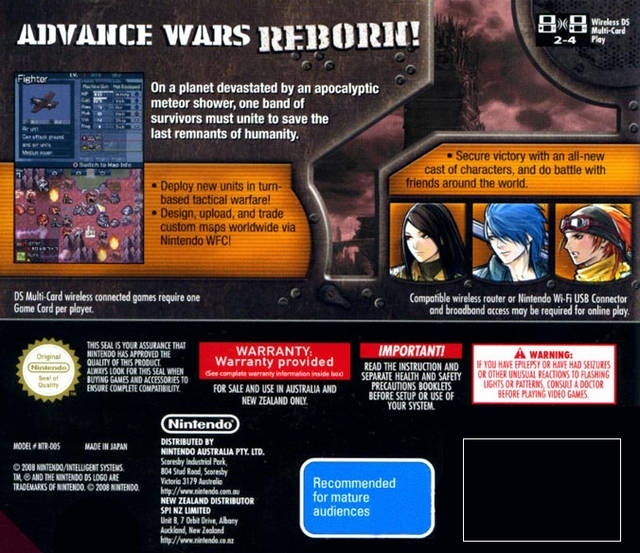 The sequel to the dual-screen handheld's hottest strategy title finally arrives. But how does it stack up to the original? 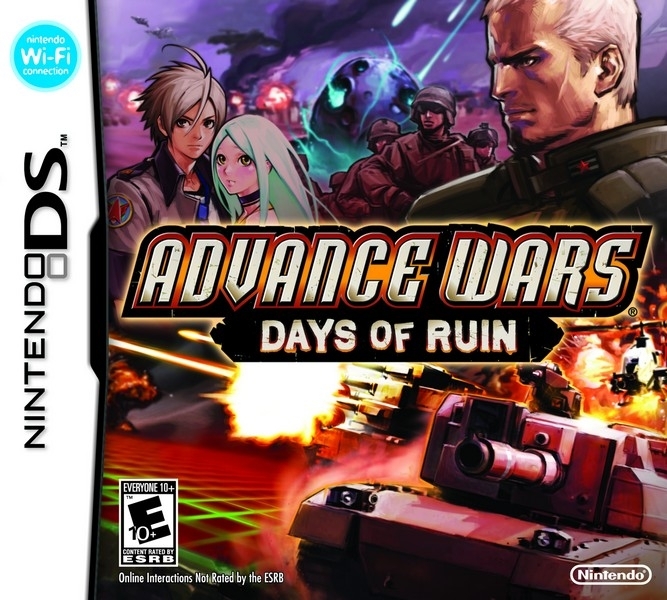 Advance Wars: Days of Ruin is the long-awaited follow-up to the franchise's first efforts on the DS almost three years ago. Released this past January everywhere except Japan, Days of Ruin offers pretty much the same turn-based strategy formula as in prior entries and pairs it up with a darker, if cliche, storyline. 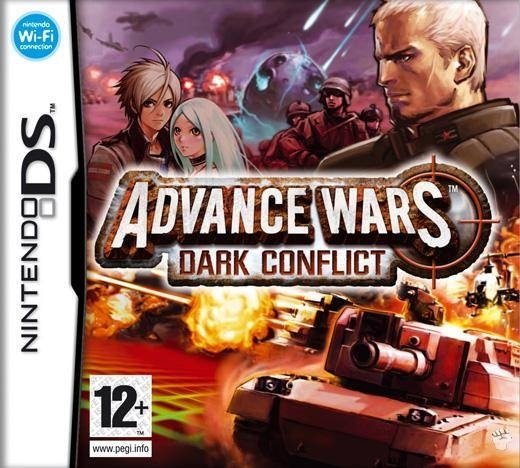 Strategy games have found a comfortable home on the DS, particularly those of the turn-based variety. In Days of Ruin, you can use touchscreen controls exclusively to select units, issue orders, and bring up menus, or alternatively you can use the D-pad and buttons for all of these actions. Both control schemes are quick, accurate, and easy to use, and which one you like better will depend largely on your own personal preference. The meat of any good strategy game is the combat, particularly in the balancing act between different units. Days of Ruin has an impressive 26 different units, spanning land, air, and sea, and the balance between them is remarkably well-tuned without being simple. Describing the type advantages that certain units enjoy as rock-paper-scissors wouldn't be doing it justice. You'll have a few different types of infantry units, mostly used for capturing buildings (which act as your resources, providing 1,000 cash a day) and crossing difficult terrain such as rivers or mountains, through any wheeled land unit cannot pass. You have three different tanks of various strengths, and a variety of long-range attackers that cannot move and attack in the same turn or counterattack. There's a few specialized units, such is the supply rig, the anti-air, and the anti-tank, with rather self-descriptive names. The naval and air units, while less numerous, are equally diverse. For airborne attackers, you have bombers reigning supreme over land and sea units, fighters taking down other air units, and helicopters and dusters filling out roles somewhere in between. On the open seas there are battleships attacking land and sea units from long-range, but vulnerable to submarines, which are hidden from the map unless an enemy unit is adjacent and themselves vulnerable to cruisers, which in turn are good against aircraft but suffer against the battleships. As a mix of the two you have the aircraft carriers, weak attackers in and of themselves but capable of producing the strongest unit in the game, the seaplanes, capable of attacking any unit in the game but vulnerable to anything good against aircraft -- anti-air, fighters, and cruisers, for example. Overall the unit balance in this game is among the best I've ever seen, a feat made even more impressive by the large number of diverse units available. That might seem like a lot to take in, but the single-player campaign mode does an excellent job of introducing you to each unit and their strategic implications bit by bit. 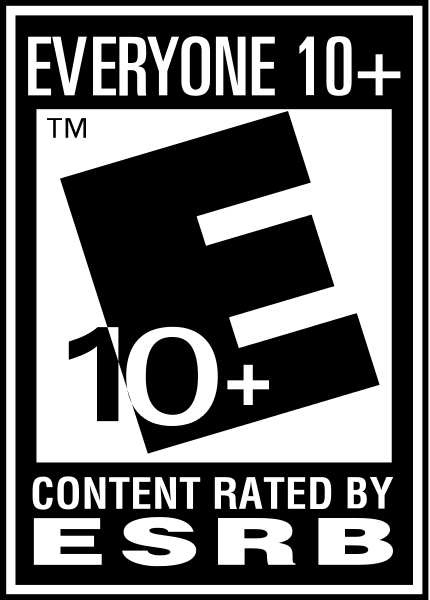 Accompanying the campaign is a dark, post-apocalyptic story, which spins an interesting narrative but comes up as over-the-top at times, especially with the majority of characters portrayed in a very shallow and cliched manner. The story is presented to you mainly with static portraits and text dialogues, with occassional static images providing the dramatic effect. The main campaign missions are generally a little easy, but on the mission select map you'll unlock a large number of trial missions that, generally, really ramp up the difficulty -- especially in those large, 4-player maps with fog of war enabled. For both the campaign and trial missions, you'll be able to earn medals based on how many turns it takes you to beat the mission, how much damage you inflict upon the enemy, and how little damage you receive in turn. For the campaign missions, you'll be able to receive tactical advice on how best to approach the scenario. The strategy aspects of Days of Ruin excel not just because of the great unit balance. You can also have a Commanding Officer tag along with one of your units, giving different bonuses to nearby units and, by killing enemy units within the range of influence, charging up for a special ability. You'll be assigned a particular CO in the campaign and trial missions, but in free battles and multiplayer you'll get to pick your own CO. The problem is that the COs are not really as well balanced as the units themselves, and you'll tend to find the same one getting used by most of your opponents. Each unit has some amount of ammunition (for attacks) and fuel (for movement), which comes into play especially for the more powerful units. As expected, units which run out of ammo generally can't attack, or can only attack with a secondary weapon greatly reduced in power. Land units which run out of fuel become immobilized until re-supplied by a rig, and naval and air units which run out of fuel crash and are destroyed. Another minor layer of strategy is that with each kill, a unit will gain a rank (up to four) which boosts its attack and defense. Terrain also plays a big factor, with mountains only passable by infantry but increasing vision in fog of war conditions, wastelands slowing down vehicle movement, and ruins and woods providing a hiding spot in fog of war, just for starters. As mentioned previously, buildings act as your resource in the game, with a number of standard Cities on the map each adding 1,000 to your treasury each day and any unit resting on an owned city will get a full ammo and fuel supply and repaired by two out of its ten hit points. Factories produce land units, Docks produce naval units, an Airports produce air units, and all three will add another 1,000 to your income and repair and resupply the unit types that it produces. 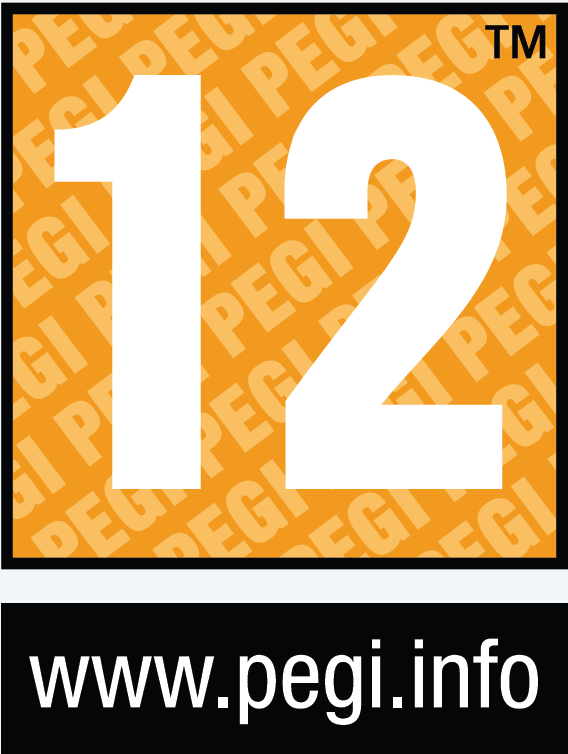 Each player also has an HQ building, which, if captured, signals an immediate defeat. Strategic planning to capture enemy/neutral buildings while protecting your own thus plays a huge role in the game. There's nothing worse than when, 30 turns into a mission, an enemy transport helicopter drops off an infantry unit right at your HQ and you know you can't get back there in time to prevent its capture. Between the campaign and trial missions and all of the free battle maps available on the cartridge, there's a lot to go through just if you're playing by yourself. But Days of Ruin also has a robust multiplayer mode, with local play and for the first time online play. If you're playing online with friends, you'll even be able to use the DS's built-in microphone (or the separately-purchased headset) for voice-chat. However, as is the case with most turn-based strategy games, the big drawback to multiplayer is the simple fact that you have to wait between turns. There's a limit placed upon each turn in online play, so at least you won't be left waiting around for ages, but the waiting might still get to some people -- especially when playing against random strangers, with whom you're not allowed to communicate. As if the missions and maps already included with the game weren't enough, you're also able to create your own maps, trade them with your friends, and play them in free battle or local or online multiplayer. There's a lot of content available, and the only drawback is that after finishing the campaign there's not much to draw you into the rest of it. Beating trial missions only unlocks more trial missions, and clearing the free battle maps doesn't unlock anything at all. Adding a bit more incentive in there would help to make that extra content more attractive and extend the play time for a lot of users. 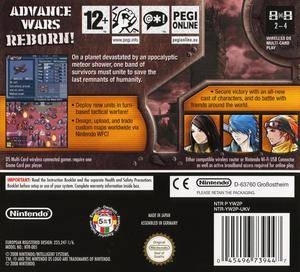 The focus in this game is on the gameplay, as you can probably tell by the lengthy amount of text required to describe it. The presentation is very simple, with a western anime style to the unit and character drawings and forgettable battle music that can get quite repetitive as you're progressing through the game. Combat is presented with simple animations of your units but they aren't very flashy and you'll probably find yourself skipping them most of the time. The interface is easy to use but with a lot of options, and some aren't easy to find. You may also find yourself accidentally issuing the wrong orders to your troops as the pop-up list of commands is context-sensitive. For instance, normally the first option for your unit will be to attack if he's next to an enemy, however if the unit is out of ammo, the only option will be to wait. If you don't notice that your unit is out of ammo, you'll be moving it to the front lines and may just click on "Wait" before you see that it isn't capable of firing, leaving your unit exposed. Overall there's an impressive amount and quality of strategy wrapped up inside a simple and unimpressive package. Strategy fans will definitely want to give this one a look, and even those new to strategy will find here a solid introduction to the genre. This was a great game. 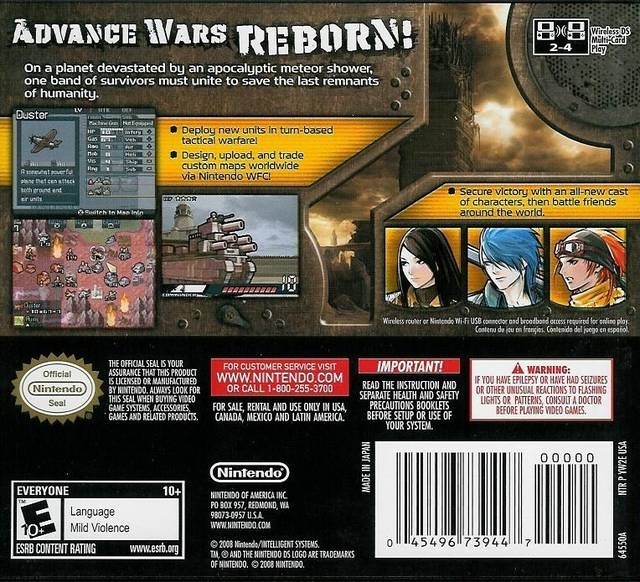 My favourite Advance Wars. I loved the story. Just got it today. Hope I enjoy it as much as I enjoyed Dual Strike! I have the hardest time with DS online games. I love this game, but it's so...damn...hard.